The VISP Ecosystem consists of two major components: the VISP Marketplace and the VISP Runtime. The VISP Marketplace aims at creating an ecosystem for IoT-based topologies by minimizing the required effort for the user to design a topology. The VISP Runtime complements the VISP Marketplace, by providing a platform to execute the previously designed topologies. The VISP Ecosystem provides a platform to implement stream processing topologies, which covers different aspects ranging from the topology configuration to resource provisioning aspects. The VISP topology parser is used to make sense of input files in the VISP topology description language format. Such files are either created manually by the user (or by the Topology Builder in the VISP Marketplace) or they can be generated automatically by the VISP Runtime in the process of executing topology updates at runtime. Each node in the topology is represented by an entry starting with $<name> = defining the node’s identifier. This is followed by a type - either Source, Operator or Sink. One or more sources are then defined in brackets where each source refers to a node that must also be defined in the same topology file (but not necessarily in a line before they are used as sources). List of locations where the operator can be deployed (a concrete location is picked from this list if none is explicitly provided). Each location is separated from the next one with a single space. Each node is deployed in one or more locations. A location is uniquely specified by an infrastructure host and a resource pool. The first is responsible for routing the data stream inputs while the second is the identifier of the (cloud) resource pool where the operator is actually executed. An infrastructure host can have an arbitrary number of resource pools. Each resource pool belongs to exactly one infrastructure host. Two different infrastructure hosts can have resource pools with the same identifier; however, they still refer to different actual pools. 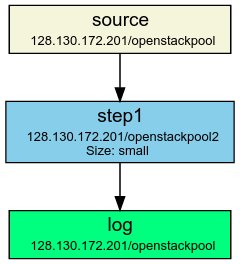 If a start (∗) is used instead of a concrete resource pool name, the VISP instance will automatically pick one of the available resource pools to deploy the container. Processing nodes are the building blocks performing the actual useful work in a topology. Each processing node has a type and a unique identifier. There may be more than one processing node of the same type (but they must have different identifiers then). Processing nodes have arbitrary many input sources (other processing nodes) and can in turn forward their output to arbitrarily many (child) processing nodes. A processing node is implemented as a docker image. 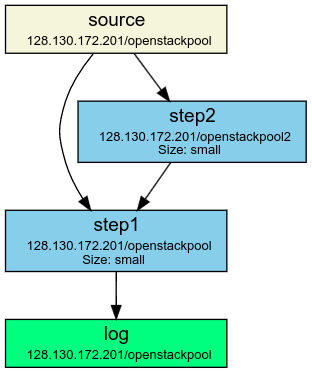 Whenever a node is instantiated by the VISP runtime, a docker container is created from that docker image on (one of) the specified resource pool(s). The VISP runtime may decide to replicate a processing node at runtime; this means that more than one docker container is deployed from the same docker image. The reason for this replication is to have more copies of the same processing nodes in order to partition the input data and divide the work between all the replicas. One interesting implementation detail concerns the way the running containers are handled in case of a topology update. Imagine A topology consisting of a source node Source, a processing operator Step1 and a sink node Sink. The following figure displays such a topology. Write an update command to a specific file inside the docker container (/root/topologyUpdate.txt). In this case, a new connection to the queue 192.168.0.1/Step2>Step1 is created and the docker container will now listen to messages coming from that queue. The VISP Runtime is able to either work on a fixed set of virtual machines or to obtain the virtual machines on demand within a OpenStack-based cloud. The reasoner component allows the VISP Runtime to update the resource provisioning configuration on demand. Currently, VISP only provides a threshold based approach, but in the future we will also implement more advance provisioning approaches. While in a real scenario, the input data would come from some device, a sensor or some other data source, the VISP Data Provider can be used to generate a stream of test data to evaluate the created topology. A few different types of such data streams are already implemented (e.g. MachineData, SequentialWait, …) and for those one just has to point the data provider to the infrastructure host and resource pool.